David Bushnell is credited with designing the first submarine used for military purposes. He is also the architect behind a humorous attack again the British shipping in the Delaware River in early 1778. Bushnell was born in Saybrook, (now Westbrook) Connecticut, in the year 1742. He graduated from Yale in 1775 and set to work on submarine warfare. Sergeant Ezra Lee was the man who first used Bushnell’s submarine (called the Turtle because of its shape) in battle. Lee was interviewed by Charles Griswold in the early nineteenth century. Lee provided Griswold with this description of the Turtle. According to this interview, Lee described the Turtle as being made of several pieces of large oak timber fitted together in the shape of a “round clam.” It was held together with iron bands, and the seams were corked before the whole machine was covered in tar to prevent water from seeping into the machine. The operator would enter from the top, by moving a metallic piece which opened upon hinges. Steering was done by a rudder, whose tiller passed through the inside of the machine. “But not the least ingenious part of this curious machine, was that by which the horizontal motion was communicated to it. This object was effected by means of two oars or paddles, formed precisely like the arms of a wind-mill, which revolved perpendicularly upon an axletree that projected in front; this axletree passed into the machine at a water joint, and was furnished with a crank, by which it was turned : the navigator being seated inside, with one hand laboured at the crank, and with the other steered by the tiller.” Two similar, though smaller, paddles were located near the top of the machine to assist in the ascension of the machine. The operator of the machine would attack by affixing its magazine to the target ship using a screw. That piece, of similar make and shape to the Turtle, was filled with over one hundred and thirty pounds of gunpowder, a clock, and a gun lock. It was affixed to the back of the machine, above the rudder, “by means of a screw, one end of which passed quite into the magazine, and there operated as a stop upon the movements of the clock, whilst its other end entered the machine. This screw could be withdrawn from the magazine, by which the latter was immediately detached, and the clock commenced going.” The clock ran for twenty or thirty minutes before the lock struck and ignited the powder. David Bushnell had trained three men in the operation of the Turtle. Ezra Bushnell, his brother, became sick during this campaign, however, and David Bushnell had to go to his second choice as operator, this being Sergeant Ezra Lee. The British ship Eagle, of 64 guns commanded by Captain Duncan and bearing Admiral Howe’s flag, was lying off Governor’s Island south of Manhattan during the campaign of 1776 and presented an inviting target. 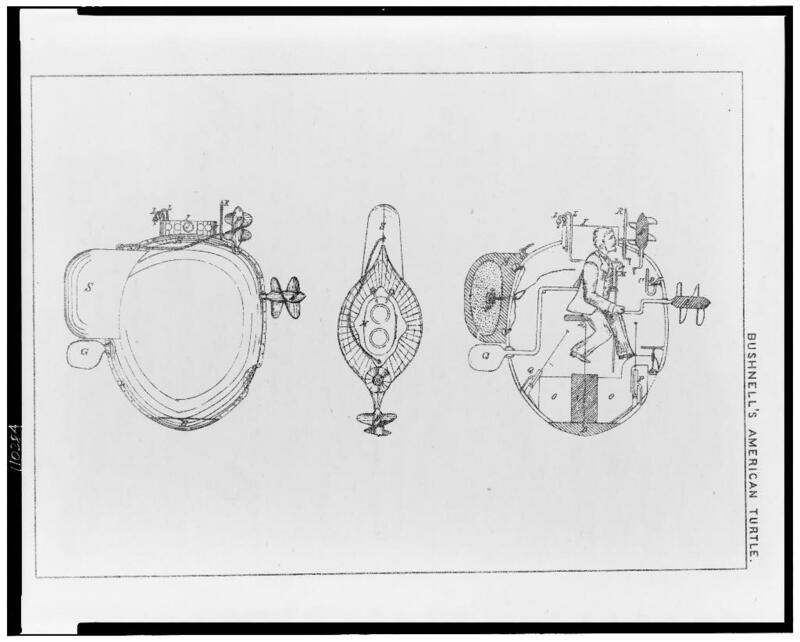 Lee himself, in the interview with Griswold, stated that he “applied the screw, and did all in his power to make it enter, but owing probably in part to the ship’s copper, and the want of an adequate pressure, to enable the screw to get a hold upon the bottom, his attempts all failed.” Lee tried different parts of the bottom of the Eagle but eventually lost the ship. He rose to the surface to get his bearings and realized that morning was coming and he was in danger of being discovered. He dove once more, but as he headed back up river, he realized his compass did not work and he would need to ascend. As the day was dawning, the British soldiers at Governor’s Island spied him, and they sent out a barge to inspect the curious vessel. Lee, not wanting the Turtle to be caught, released the magazine in hopes that the British would approach and be killed by the explosion. The British, however, rowed away from the magazine and from Bushnell’s Turtle. The magazine eventually drifted into the East River, where it exploded. The Turtle was eventually sunk by the British near Fort Lee, New Jersey, as it sat upon its transport ship. Thomas Jefferson later wrote to Bushnell, inquiring about the machine. Bushnell responded to Jefferson that he had salvaged the machine, but later destroyed it. The Connecticut River Museum, in Essex, Connecticut, houses a replica of the Turtle. Thus ended any serious attempts at using submarines in warfare until the U.S. Civil War, when a Confederate submarine, the H.L. Hunley, successfully sank the USS Housatonic, a Union ship, in the waters off Charleston, SC. The Turtle was not David Bushnell’s only foray into marine warfare during the Revolution. On January 6, 1778, Bushnell unleashed another of his experiments on the British. For all of his pioneering work, Bushnell died largely unknown in Georgia, where he was buried in an unmarked grave. The American Journal of Science, vol. II, no. 1, 1820, p. 95-98. That volume can be found here. Lt.-Commander J.S. Barnes, U.S.N. Submarine Warfare, Offensive and Defensive. Including a Discussion of the Offensive Torpedo System, Its Effects Upon Iron-Clad Ship Systems, and Influence Upon Future Naval Wars. New York: D. Van Nostrand, 1869, page. 23. The American Journal of Science, vol. II, no. 1, 1820, p. 95-98. Lt.-Commander J.S. Barnes, U.S.N., page. 24. Michael J. Crawford, ed., Naval Documents of the American Revolution Vol. 11, Washington, DC: Department of the Navy, 2005, p. 78. Image credit: “Bushnell’s American Turtle” from the Library of Congress. A version of this piece previously appeared on the author’s blog.